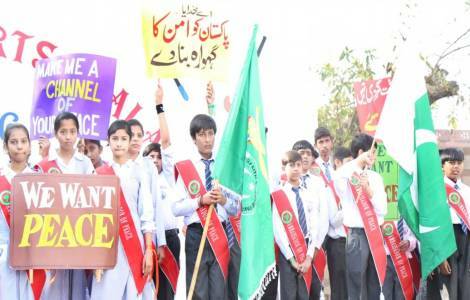 Lahore (Agenzia Fides) - A peace march, carrying signs with messages of peace and harmony for the country: is the initiative experienced by Muslim and Christian children of the group created by the Council for interreligious dialogue in Lahore. The Council, chaired by the Capuchin friar Fr. Francis Nadeem OFM Cap, with other Islamic leaders, launched the initiative, dedicated to children, involving children as "Ambassadors of peace". Christian children and Muslims are gathered to propose and live events and initiatives that promote interreligious harmony, development and reconciliation in the country. During the march the little "ambassadors" chanted slogans like "we want peace", "No to hatred and yes to peace". They then prayed for the success in the fight against terrorism, calling for the end to the bloodshed in progress in the country. The children released doves and balloons, symbols of peace and brotherhood. All children, of all religions, prayed the prayer of peace of St. Francis of Assisi, which characterizes all the meetings of the Interreligious Council: "God, make me an instrument of your peace".